This is a 1936 Aurora Etiopia eyedropper-fill “Trench-Pen” in Ivory Casein. GFT, including the wide “Greek Key” cap band in the center of the two narrower bands. Aurora’s marketed the pen as having been manufactured for Italian military officers who were engaged at the time in the war in Abyssinia (Ethiopia), it was never commercially available in shops and the fact remains that it is a very rare item. The cap adorns an engraved eagle and the blind cap unscrews for ink pellet storage. Fine, flexible nib. User grade (and priced accordingly), but so rare and of historical importance, I am offering it here. Slight discoloring of the cap and barrel; sealed cap lip cracks; two spots of minor pitting to the celluloid barrel. Item #146 in Catalog #84. 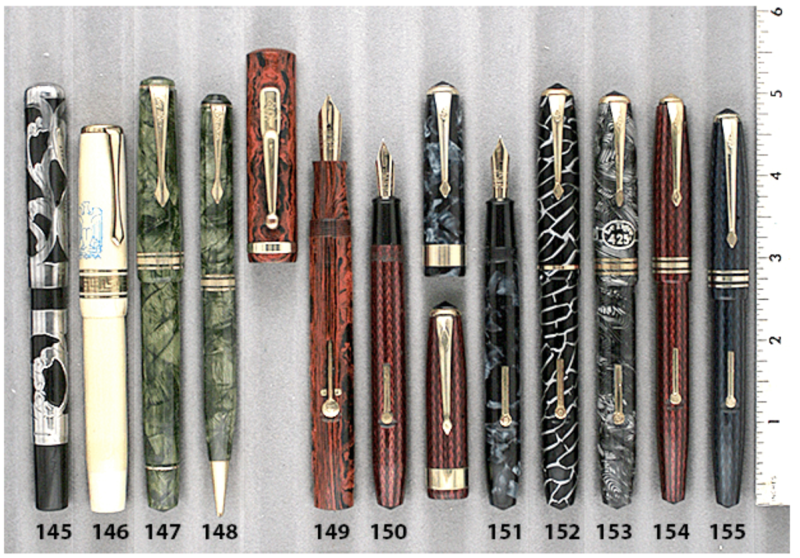 This entry was posted in Vintage Pen, Vintage Pens and tagged Aurora, Catalog, Catalogs, Extraordinary Pens, Fountain Pens, Go Pens, GoPens, Vintage Fountain Pen, Vintage Fountain Pens, Vintage Pen, Vintage Pens. Bookmark the permalink. Follow any comments here with the RSS feed for this post. Post a comment or leave a trackback: Trackback URL.